The content distribution veteran is losing media business to hard-nosed competition, but expanding in the security and performance markets. Shares of Akamai Technologies (NASDAQ:AKAM) fell as much as 16.8% on Wednesday, following Tuesday night's release of the content distribution specialist's first-quarter results. As of 2:08 p.m. EDT, the stock was down 15.2%. In the first quarter, Akamai's adjusted earnings rose 5% to $0.69 per share on a 7% year-over-year revenue boost to $609 million. Both figures were ahead of Wall Street's consensus estimates and landed at the high end of management's guidance. But Akamai's guidance for the second quarter fell far below the current Street view. Analysts were modeling earnings near $0.65 per share on revenue in the $623 million range for the next period, but management's guidance ranges topped out at $0.61 and $609 million, respectively. Akamai CFO Jim Benson noted that media-related revenue is slowing down in the second quarter and could keep falling in the second half of 2017 as well. That market is highly competitive, especially when it comes to serving up software downloads for video game platforms. The company remains committed to the media distribution space for the long term, although security solutions keep claiming larger and larger portions of Akamai's business focus. Share prices have been unusually volatile in recent quarters, bouncing as high as $72 and as low as $48 over the last 52 weeks. 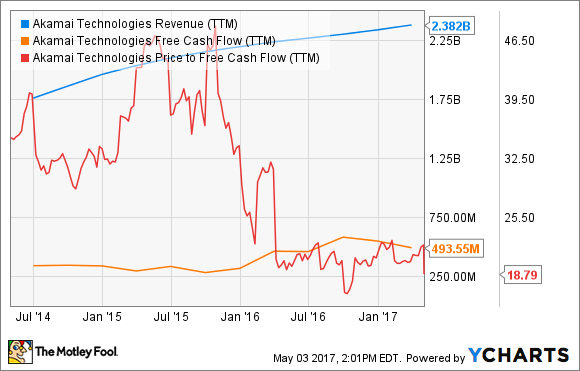 But revenue continues its steady rise and cash flows remain stable, and the newfound focus on security services looks likely to serve Akamai well in the future. AKAM Revenue (TTM) data by YCharts. Investors might want to pick up a few Akamai shares at this deep discount, and keep their eyes open for future buy-in windows as the company's business model evolves.